Towards the west side of Big Bend National Park at the foot of the Chisos Mountains, Burro Mesa is a low, gently sloping volcanic plateau bordered on the east side by a straight escarpment and to the west by a more uneven line of cliffs and slopes, broken up by many small canyons. 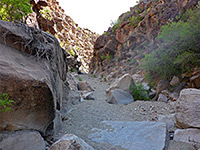 One of the larger drainages is Javelina Wash, which crosses the south end of the mesa and at one point falls over a sheer, 100 foot pouroff, at the end of a short enclosed section. The half mile trail that leads to the base of the pouroff is easy and relatively popular, but not so many people walk to the top of the pouroff, a hike of 1.8 miles, somewhat more strenuous due to rougher terrain and a few minor obstacles along the way. This route, the Upper Burro Mesa Pouroff Trail, encounters fairly open the scenery at first, following the upper, boulder-strewn section of a tributary wash, then joins the main streamway about half way to the drop-off; most of the lower section is partly cliff-bound, and more impressive. 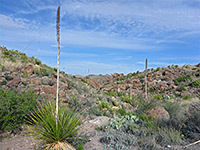 The open terrain in the upper streamway is good cactus habitat, while the rocky crevices and shady patches along the lower canyon are home to a good range of wildflowers. Map of Big Bend National Park. 17 views along the trail. 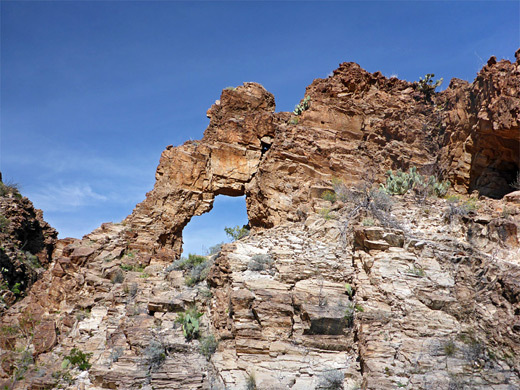 The Upper Burro Mesa Pouroff trailhead is along Ross Maxwell Scenic Drive, at a signed pull-out on the west side, 7 miles south of Panther Junction Road and 1.5 miles north of the turning for Sotol Vista Overlook. This section of the road is slightly elevated, and has good views northeast towards the Chisos Mountains, though low hills obscure most of the land in the other direction. The path starts at the brink of a wide, shallow valley, covered with sotol, ocotillo, opuntia, cholla and bushes; it descends gradually to a dry creekbed, then follows this westwards. 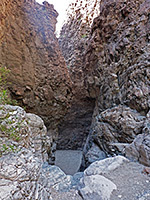 The drainage narrows after half a mile, entering a shallow, rocky ravine, and descending via a few steps and chokestones. Purple snapdragonvine flowers grow in shady crevices. The wash soon widens again, still containing many boulders, and leads to a small dryfall preceding a bigger drop, which is passed on the left side. 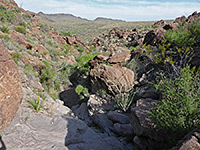 A few more enclosed, rocky places and small descents are followed by open, flatter ground where the creek passes a junction with a north-side tributary and widens, the floor now a broad sweep of gravel, and the main drainage of Javelina Wash joints on the right (north). A sign reminds returning hikers to turn right at this junction, rather than continuing along the more obvious route upstream. 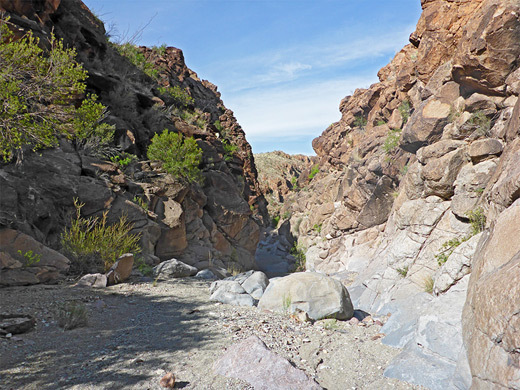 Below this junction, Javelina Wash stays unconfined for a short distance until cliffs appear, initially to the south. After two white bends, and two more tributaries, one on either side, the creek enters the first properly narrow section, where are the walls rise vertically on both sides, up to 200 feet high. All of this section is in shadow in the morning. The most abundant flowers here include gilia, salvia and jewelflowers. 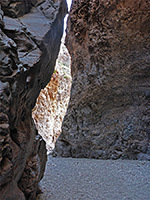 The cliffs open out for a short distance then return, just before two tight bends centered on a jagged arch, about 40 feet up on the north side. 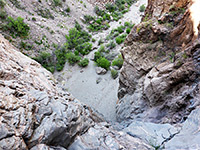 As it approaches the final bend, near the pouroff, the canyon floor drops 20 feet via stepped falls, and then over a taller fall in an enclosed space, an obstacle that looks at first too steep to climb but it is actually quite easy to pass. Beyond is a confined, shadowy, circular chamber at the brink of the big drop. Overall, the hike passes a good variety of scenery and desert plants, is just a little testing, and not too long.